How Big is the Mormon Church? In 2014, the Mormon church claimed 15 million members. Most of these members, however, hardly ever go to a Mormon church. A significant number don’t consider themselves Mormon. Some may not even know they are counted as members by the Mormon church. This article takes a closer look at some of the underlying statistics. Click here for an infographic on Mormon membership statistics. 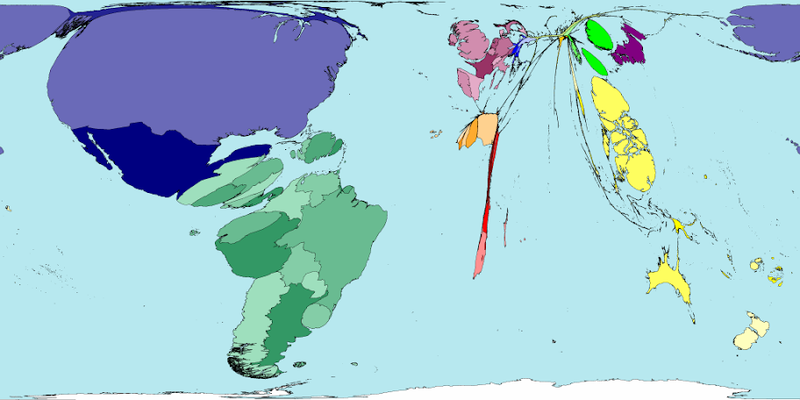 On the church’s website, country statistics are grouped by continent. The table below summarizes these data as they were extracted on January 13, 2015. The activity rates were taken from this website. The 4.5 million active Mormons make up a fraction of a percentage of the general population, with only a few notable exceptions: Utah (27%) and a dozen or so Pacific islands like Tonga and Samoa (6% of the combined population of these islands). The average congregation size is 156, a number that is largely determined by US congregations. Only 13 countries and 7 territories are on or over this average. A better measure, therefore, to get an impression of the size of a typical Mormon congregation would be the median of 97. To maintain the illusion of growth in spite of the church's declining growth rate, church president Hinckley instigated an ambitious building programme to sharply increase the number of temples. In the years between 1995 and 2010, Hinckley repeatedly framed the increasing number of temples as a sign of growth. An inventory by Mormonism101.com, however, shows that Mormon temples are idle more than half the time. 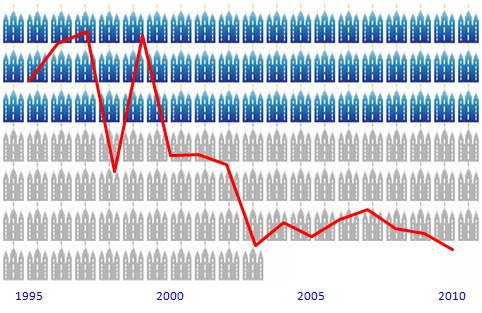 In the illustration below, the red line represents the church's declining growth rate. The temple icons represent the 131 operating temples at the time this inventory was made. The capacity of each temple, based on the number of endowment rooms, was then compared to the number of scheduled endowment sessions. This showed that Mormon temples are idle more than half the time (54% at the time of the inventory, represented by the grey temple icons). In this way, Mormon temples have become the quintessential PR-instrument: pretty on the outside but empty within.